1) All registered FPZ members are elligable and encouraged to participate. If you've been lurking this is a great time to register and play. 2) All photos must be taken , processed and posted between 6/1/12 - 6/30/12. When posting photos please give info on lens used for the shot. 3)Wikipedia defines "normal focal length" for a 35mm format camera as a lens between 40mm-58mm so any prime lens / lenses in this range can be used. DSLR or 35mm film cameras only (no mediun or large format cameras please). If you want to play but do not have access to a prime lens in this range please send me a private message and we can discuss use of a zoom for this contest. 4)In the interest of keeping the thread lively you are encouraged to post as many pictures as you'd like , however by 6/30/12 you must declare no more than 3 pictures as your official entries. 6)Choice of subject is wide open (within reason), so be creative and have fun. 7)A prize will be awarded to the creator of the first place image. Last Edit: 6 years 10 months ago by DamnRedneck. Great set up. Thanks for putting this together. I'm in. Last Edit: 6 years 10 months ago by blackcloudbrew. Fantastic idea DRN! I've got my favourite 50 snapped on the K-5 and I'm ready to rock doc! Last Edit: 6 years 10 months ago by J.Scott. Sounds great DRN! I've been trying to come up with ideas already. With this timeline, I may actually be shooting and submitting some b&w film images. So, I'll ask for dispensation if I do either 645 or 6x7 images. If I use those cameras, I'd be using a 75mm lens for the 645 or a 105mm lens for the 6x7 as those are the 'normal' lenses for those cameras. I can stick to 35mm film and keep it to the 40-58mm criteria but I have more fun with the medium format cameras. Ok? Tim, you're my buddy , you're my pal but you're killin me here. By all means go use your big guns , hell I'd love to get the Mamiya out of it's case ...... but not for this Shoot Out. So lets get this thing rolling! Ladies and gentlemen start your cameras! Hey, what about the Israeli National Anthem? I'm sure they have a NASCAR or some similar deal. Right Pablo? Actual sporting events are too localized. Just hum the theme to "Rocky" and instead of boxing, imagine a camera training montage. That's universal language. Starting the Normal Shoot Out, I give you... um, me! This started with me deciding I wanted a Mad Max-like goggle photo and that I might as well try it with one of my 50's with this shoot out on. Gradually it became more ambitious. Off-camera flash became gelled flash and a place wall was replaced by a more industrial-looking background when I got the idea to try to squeeze a dash of science fiction into the image. You all can tell me how successful I was. On the technical side, I would've preferred to try this shot with my 50mm f/1.2 AIS to get a more cinematic kind of rendering, but manual focus gets tricky when self-portraiting and needing to do a lot of shots. As it is, I had a devil of a time getting the focus to lock properly. My "performance" was also an issue, as being unable to frame myself, I only had a vague idea how I looked each time. My best performance was not my best framing, but ultimately I had to go with best performance. Last Edit: 6 years 10 months ago by Leighgion. What an interesting first entry for our latest shoot-out! 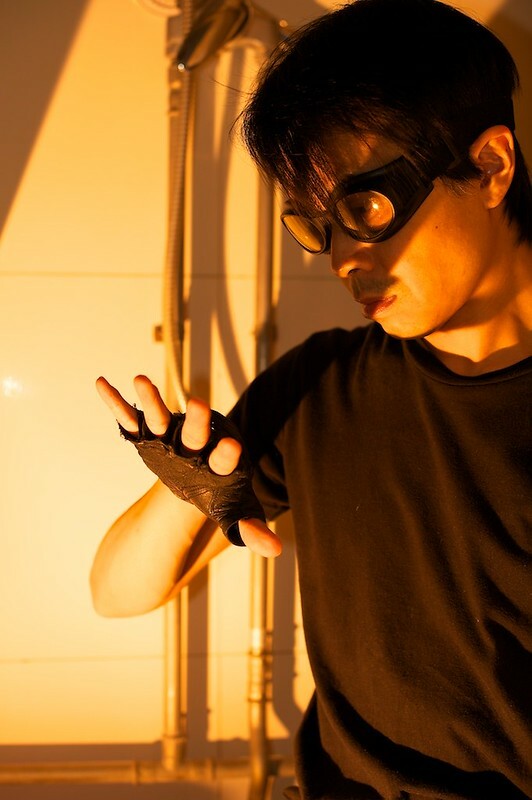 I like your pose; the goggles and the hobo-gloves are especially effective together. But it has that 'Mad Max in the loo' look to it. I find the pipes a bit distracting. It may be more demonstrative with a plain or muted background. But I will admit it is quite challenging to be director, photographer and leading actor. Clint Eastwood has pulled it off a few times with arguable success and I think you are off to a great start! Great start indeed! And a new avatar! A twofer. I love it! This image has a great feel to it. An excellent use of a 50mm lens. Although I tend to agree with J.Scott that those look like shower pipes in the background. I wouldn't get that impression if it wasn't for the damn flex hose coming down from the top. Cool... I'm in, I've got an old 50 I can play with.